Ted said that he didn't like his new Ambassador. I had seen the very machine to which he was referring. 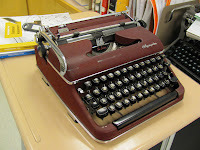 It had been sitting in the Mesa Typewriter exchange for months gathering dust and looking generally sad. After a little negotiation, Ted was willing to give me the Ambassador to see if I could make a go of it. After a few hours of working I have resurrected this great green giant to an acceptable state. I'll start with the paint. I had thought it was really dusty, but on closer inspection I could see that the paint was terribly oxidized. Every surface was dusty with powdery-white oxidation. I know that heat can do that to paint, but I had never seen it so evenly cast over the body. It must have, at some point in its life spent a lot of time in a hot room. Not being prepared to strip everything, I decided to try some cleaning wax. The thought was to give it a sheen similar to a regular Hermes while stopping the paint from dusting off. It seems to work. Obviously, the paint is nowhere near as durable as it once was, but it looks good and will be good enough until I make a final decision about the paint. The whole machine was filled with grit so a lot of my time was spent just getting the Arizona dust of the carriage guide rails. A couple drops of oil really freed every thing up. As Ted reported, the platen is in a sad state, but I have never seen an original Hermes platen that wasn't rock-hard. Fortunately the feed rollers are still really soft and grip the paper well. If you use two sheets of paper it works great. I tend to use two sheets of paper regardless. If time and money is freed up I might send the platen to Ames for recovering. This model has a twin ribbons system. It can use standard fabric ribbons or the lovely high-definition film ribbon. This particular machine came with a completely full film spool so I didn't have to install a ribbon. As desktop typewriters go, the Ambassador is really ridiculously large. It dwarfs pretty much any desktop typewriter. My HH looks like a portable next to this thing. I have no idea why the size. 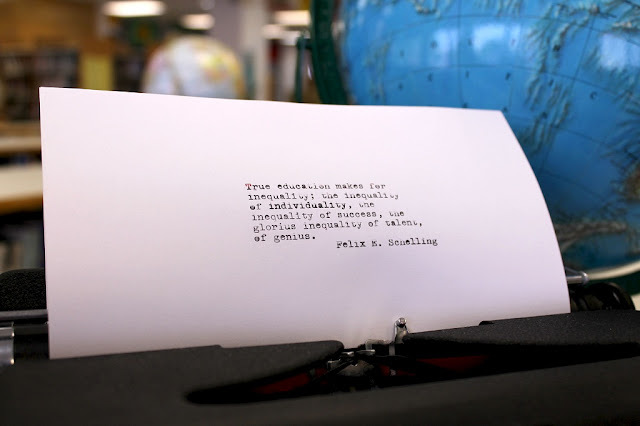 Maybe it's the one typewriter to rule them all. 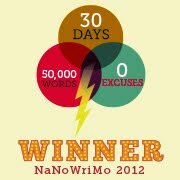 No students have used it yet, but I will make it available tomorrow for part two of a two-day project. I am sure there will be some interested takers. It types like a dream and is filled with every bell and whistle. I love the paper injector. It makes you feel like you are shifting a really fast car into first. The decision that I am facing is whether I should make this into a Silver Surfer. Shining it to a mirror finish might make this the most formidable typewriter ever. 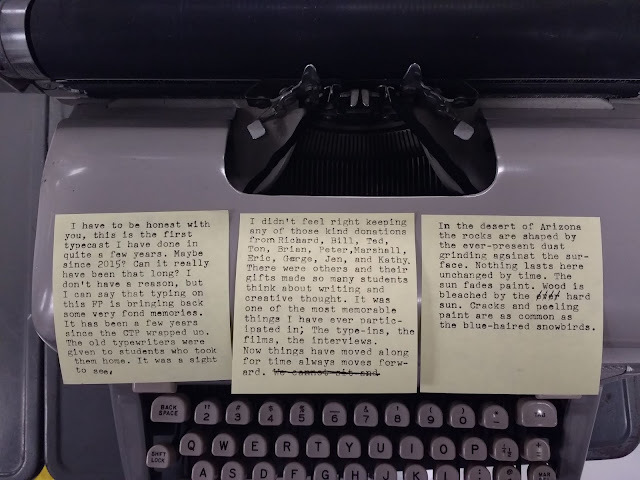 I really glossed over the filming for the Typewriter movie and Mrs. Magic Margin thought people might like to hear more about it. As class started you could tell the kids were excited. They knew that it was the day that Jack, the cameraman, was going to be filming for the documentary. I didn't notice it until Mrs. Magic Margin (who's also an English teacher at Alhambra) mentioned that many of them looked like they dressed up. Most of the girls had done their hair and chosen outfits just for the occasion. The boys had neatly pressed t-shirts and clean shoes. 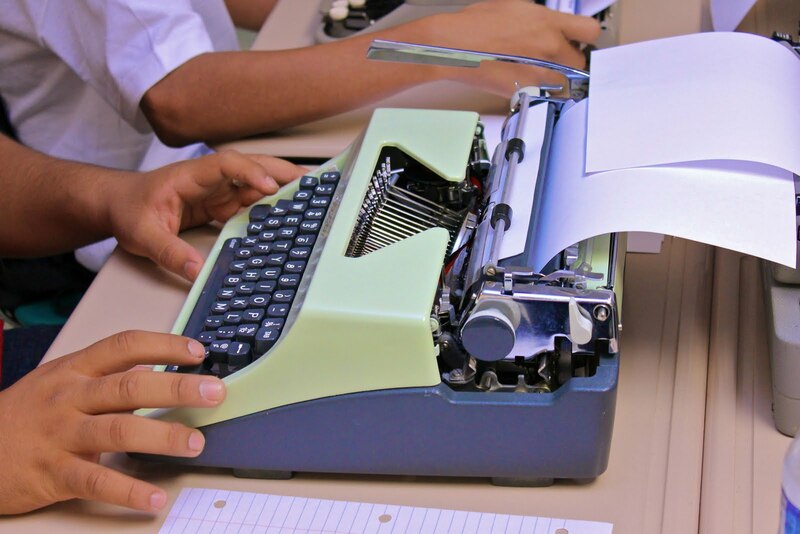 Since some of the kids in this class hadn't used the machines before, I made a short slideshow presentation to lay out the basic parts of a typewriter and how to load the paper. It's almost pointless to do these introductions now. 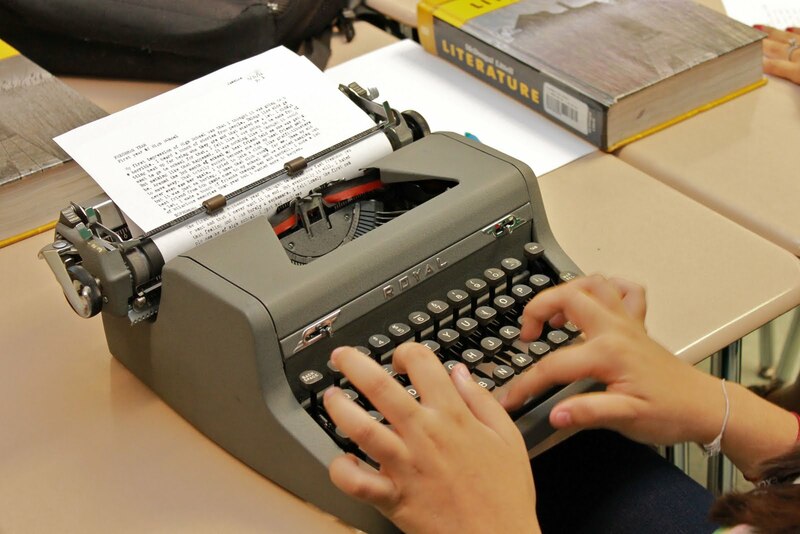 Most kids at Alhambra have had some sort of contact with a typewriter before. They aren't the mysterious machines they were two years ago. If that is the only measure of success with the CTP, I would be immensely proud. 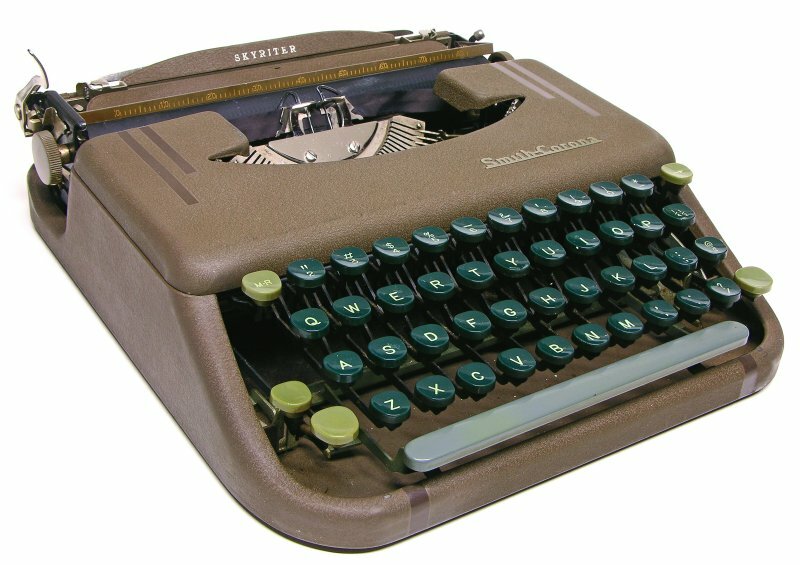 I went through the parts and gave my basic spiel about the typewriter offering distraction-free wirting. They have all heard the mantra before. They wanted to go to the shelf and choose one to use. That's what I like about having such a diverse collection of machines. 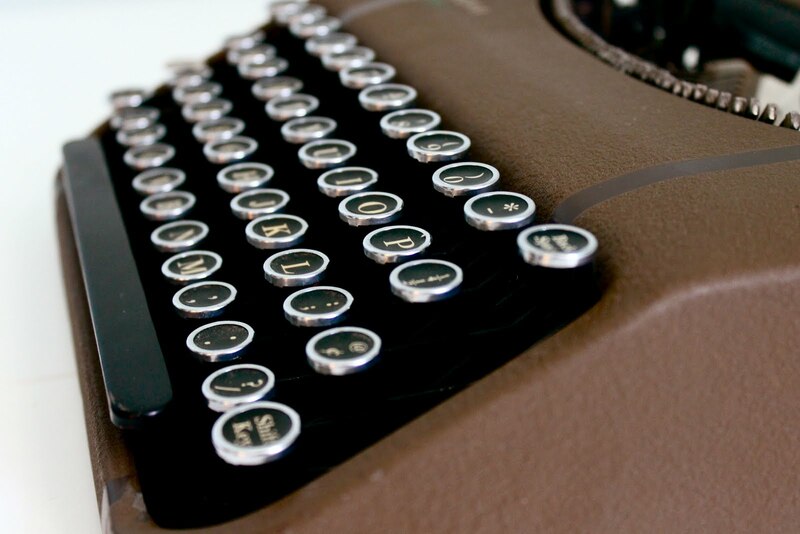 You can choose a typewriter that fits your personality. They come in a wide variety of styles and it's interesting to see which ones they pick out. I've noticed that students with "old souls" tend to pick pre-war machines. I have a couple of Remington Model 7s and an early 40s Arrow that are often picked up by students with a timeless personality. Others, however, are persuaded by the histrionics of flashy chrome trim and fun colors. This time around there were a number of Hermes selected (of course) and a good number of mid-century Royals. moved to more spacious digs. 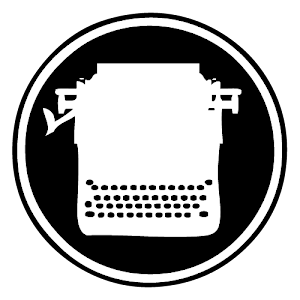 J., a new inductee to the world of typewriters, went to the shelf to choose a typewriter. She gravitated toward the deep maroon Olympia SM3. Taking it back to her desk she said, "Look. It matches my nails." And, you know what, her nails were an identical match. I gave them a little time to get used to the typewriter they were using and then I gave them the most post-modern assignment ever. 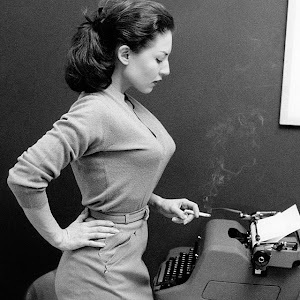 They were to write a letter to themselves on a typewriter explaining what their life will be like in 30 years. They used an antiquated device in the digital era to speculate on the course of their future. The whole class period was great and you could tell they were proud to show off something unique about their school experience. 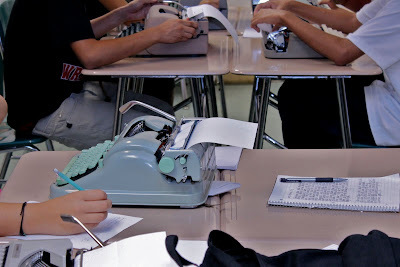 It's not every day you get a chance to use a typewriter in school anymore. 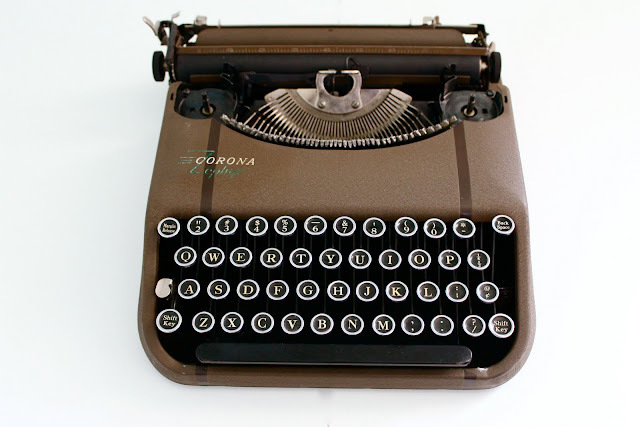 As I think about the goals of this project, I am starting to understand that it's less about getting students to write distraction-free and with greater awareness of what they write and more about sharing my love of typewriters and the appreciation of something wholly mechanical. 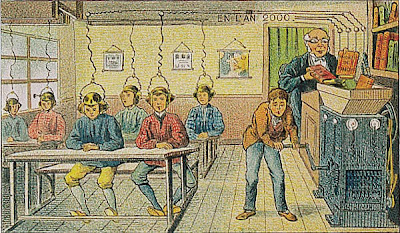 There is an evil assumption in education that student engagement can only be achieved through the use of modern technology and unceasing novelty. This faulty logic assumes that because these kids are so "plugged-in" that, if what they do in class is not equally "plugged-in', they will not respond. They will shut down and give up. That's a canard. It's not the technology that matters. 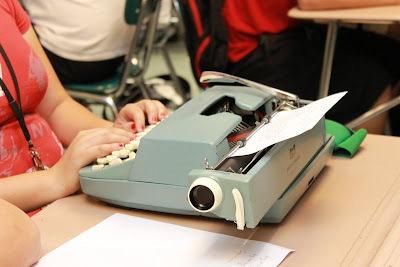 You can only type on a typewriter, but the impact on a student far greater than I have ever imagined. P.S. I have heard form several kids that if this movie goes big we have to go see it. Gary Nicholson, if you need screaming teenagers at your movie, I got 'em. The really old table under the Selectric is probably in keeping with the time-frame. The white board, however, gives it away. The two angle and rotation bands fell off their respective wheels. So, the element wasn't moving to the correct position and the angle was all messed up. After getting them set properly the machine was as good as new. The motor must have been replaced recently as it purrs with only the gentlest of hums. 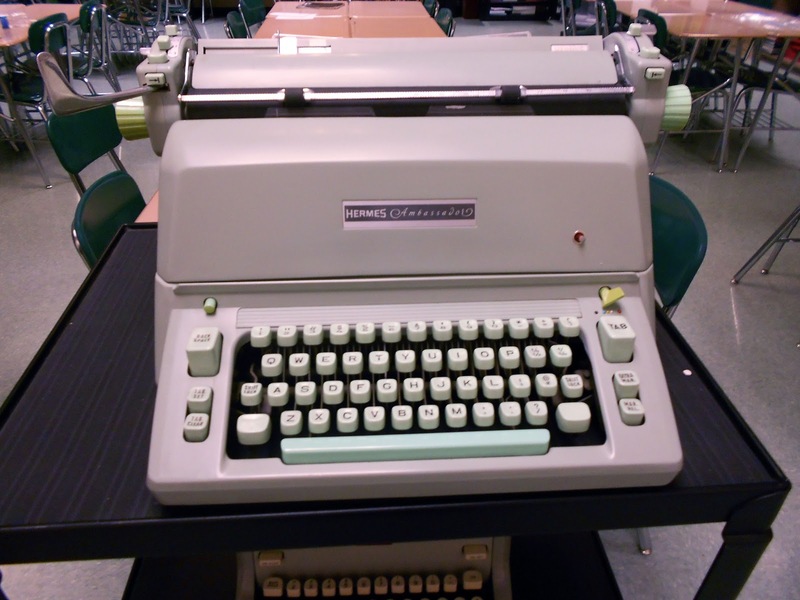 I am not an electric typewriter fan, but considering the historical importance of this machine (and the fact that I already have a ready supply of type elements) I am apt to let it stay in the classroom. The size is much better than that Vader-like machine that I gave to Bill Wahl. 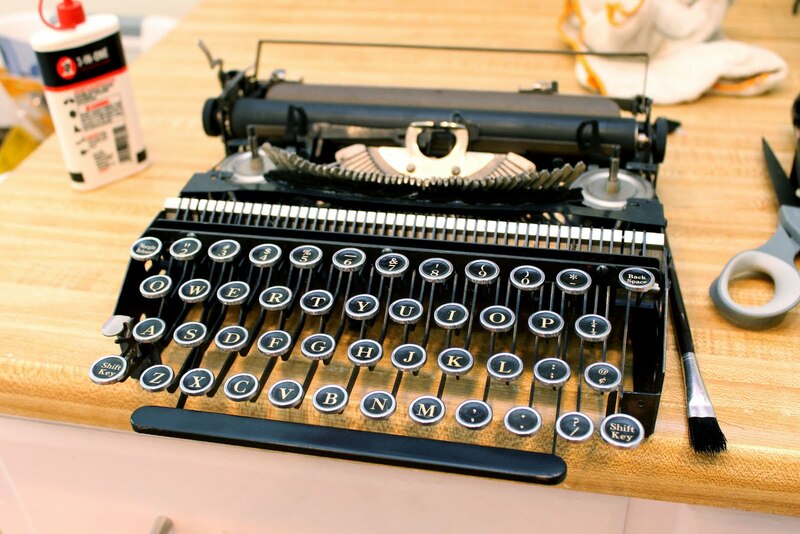 It comfortably fits on a desk or typewriter table. These machines are the easiest things to open up even if-- once on the inside-- you find that they are more akin to Brazil-like devices designed to baffle all but the most experienced typewriter repairman. Looking at those 2800 possible mechanical adjustments would drive you mad. It's clear to me that the engineering team were geniuses (and Noyes was an artist). But with every silver bauble there is a little tarnish; there is something missing. The paper scale at the top seems to have vanished. It didn't have one when it was given to me, so I can assume that it was taken off long ago. Perhaps the old owner didn't quite "measure up." 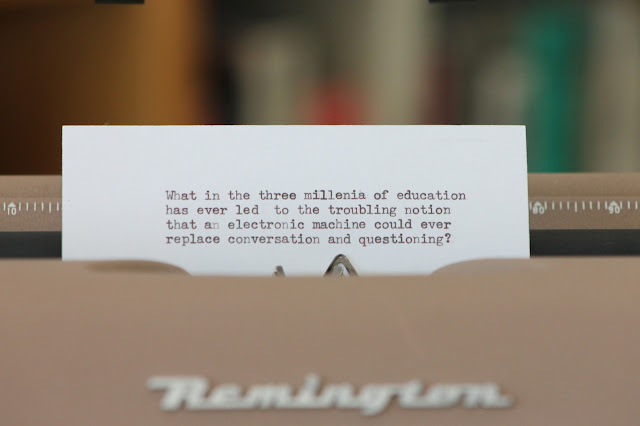 If you haven't been to the Kickstarter page for The Typewriter (In the 21st Century) you should go there now. Here. 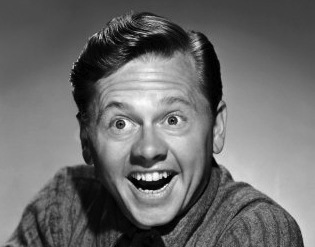 Oh, I'm 31 now. Still younger than most of my typewriters. 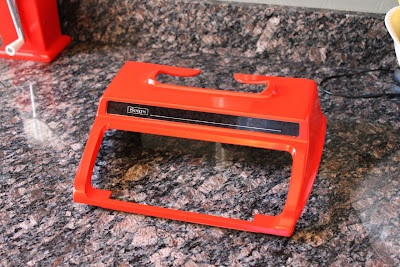 This Sears Manual 1 ribbon cover is almost nearly, but not quite entirely unlike an Olivetti Valentine when painted red; as you can see in the before and after. See, just like a Valentine. 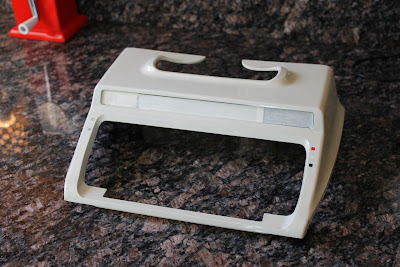 I've been using Valspar's plastic-bonding spray paint for pieces like this. It really seems to bond well to the plastic. Time will tell how it stacks up to use and abuse. Full Disclosure: I attended a parochial grade school in the early 1980s. Our school still used spirit duplicators because they were still very cheap to operate. I'm not that old. 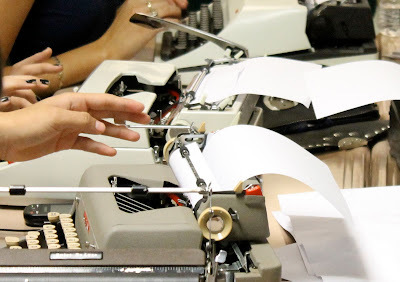 It's not every day two teachers who love typewriters get the chance to talk. I had the fortune to be interviewed for an upcoming episode of The Tightwad Teacher. This podcast focuses on how to cheaply integrate technology into a classroom setting. 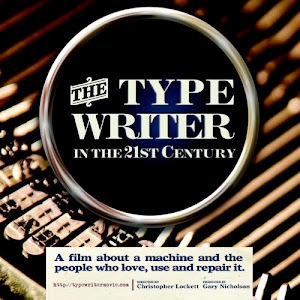 I was contacted by John, one of the hosts, who also has a fondness for typewriters. It was a really interesting conversation and as soon as the episode becomes available I'll post a link to it on the sidebar. 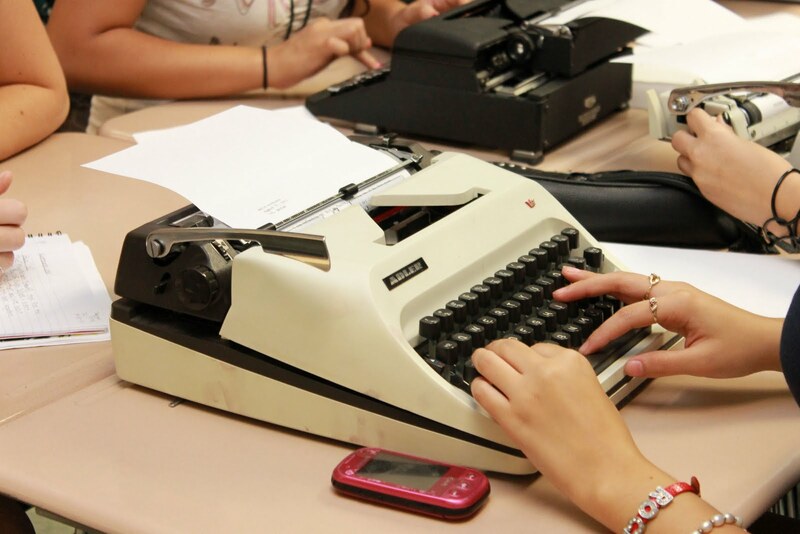 The CTP is slowly making typewriters a thing at Alhambra High School. 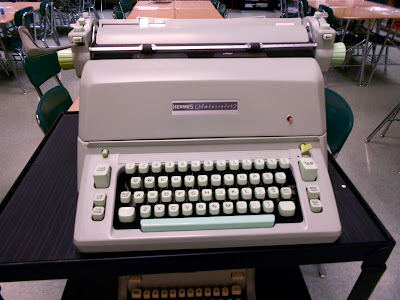 The school library is now home to a working Royal FP in minty green. 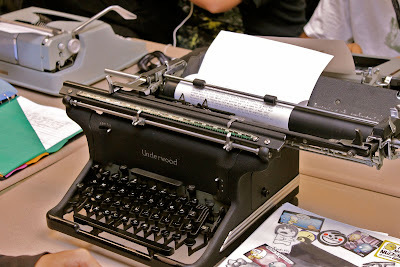 A few days ago the librarian, Tim, came to me and said that he had a typewriter that wasn't quite working. He asked me to take a look at it and after a few minutes oiling the Magic Margin (our namesake), cleaning the type, and winding a new ribbon, the Alhambra Library is rocketing strait into the retro future. Tim cleared a small place out on a built-in counter and there it sits, proudly, waiting for the type-clack of creative fingers. The CTP salutes Tim and his efforts! This pre-WWII ultra-portable is the newest acquisition for my personal collection. Sure, it's missing the paper support with the De Luxe decal. Sure, the ribbon covers are nowhere to be found. Sure, it was a little scratched up, but after new felt, a bit of cleaning, and bending the type into alignment it's a fun little typer. The insides were quite clean and only needed sweeping out with a brush. As with all old Coronas, the felt pads were gross and smelled like death's cologne. The Zephyr has an interesting body shell. As you can see, it is one piece where the frame slides out the back. This makes for a terrible time when you want to take the frame out for cleaning or oiling. The upper row of keytops needs to be depressed while while you slide the frame out. It's very tricky and hardly for the ham-fisted among us. 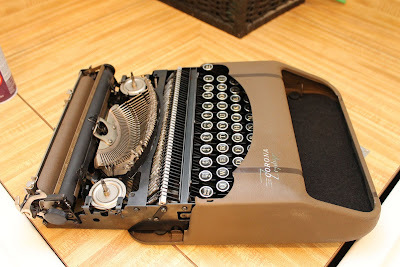 The Skyriter refines this by making the case much simpler to remove at the expense of the sophisticated Zephyr's lines. 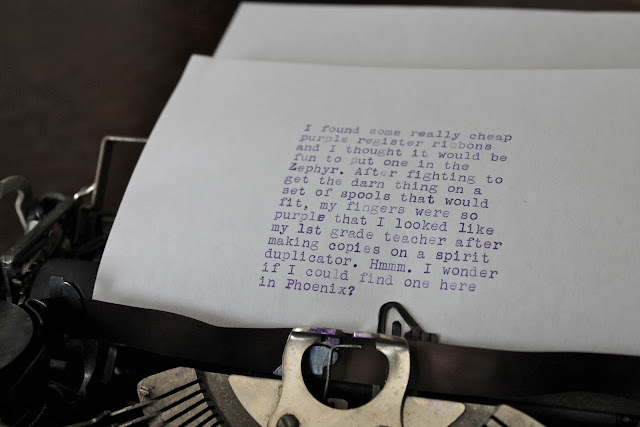 While not the best typer (hollow sound often ghosting characters), the Zephyr/Skyriter line is becoming my favorite ultra-portable typewriter. They have a simple and charming nature about them. They tend to be fairly rugged and easy to work on. They are not nearly as foppish as the minty-green Rocket. Take that Hermes fans! 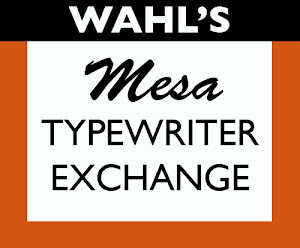 They are honest typewriters. Really, you could consider them the Mickey Roony of typewriters; fun, a classic American, and small. My classroom technology set-up is pretty basic. I have an LCD projector, a computer (which works very nearly all the time), and speaker installed in the ceiling. Overall, it's fairly standard when it comes to technology in the classroom. Some classrooms have SmartBoards, but I am not one of the chosen. 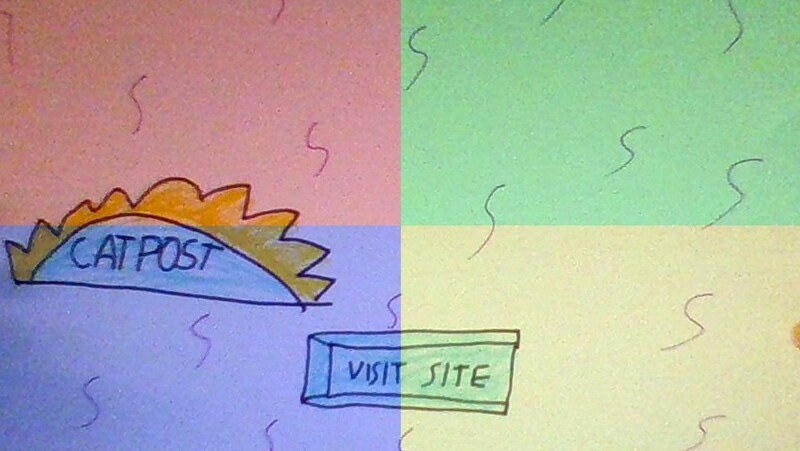 Anyway, I tend to shy away from slide-show presentations because I think they are boring. I do use them occasionally. Mostly, the projector is used to throw graphic organizers and other visuals on the screen. It serves the same function as an old overhead projector with acetate transparencies. I do have about 12 computers in my room, but they are used for my Yearbook and Newspaper classes and are not used by the lion's share of students who come through my door. The technology has been...acceptable. Sometimes it works well. Sometimes it doesn't. Sometimes I have to spend 5 minutes fidgeting with some cable or settings while my students chat. Sometimes I want to punch Microsoft Windows 7 in the face. Teaching isn't a very easy job and when the tools on which you rely don't work properly it makes things all the more difficult. We do have boffins who are happy to come and fix things, but you can only contact them through our Brazil-like on-line help ticketing system. It's not a great situation, but things are starting to become much worse. Technology is creeping into the new Common Core standards for Language Arts and Mathematics. In addition to teaching critical thinking, language, grammar, literary analysis, I am supposed to teach basic computer literacy. Computers and their applications are becoming the new silver-bullet in education. School districts like the Kyrene Elementary District-- a suburban school district outside Phoenix-- have invested heavily in one-to-one laptops, Smart Boards, and expensive educational software that would make the learning environment more valuable. You can read a really great article about it at this link. Policy-makers and reformers have a positive gut-reaction to computers. Everyone believes that they enhance learning environments. Computers are interactive and engaging. However, there has been no conclusive evidence that computers do what the reformers claim. Larry Cuban, Education Professor Emeritus at Stanford University has stated that there has been no evidence to support that huge investments in technology translate into higher student achievement. The idea that technology can fix what ails us is a canard continued by companies that have a vested interest in nation-wide educational technology integration. 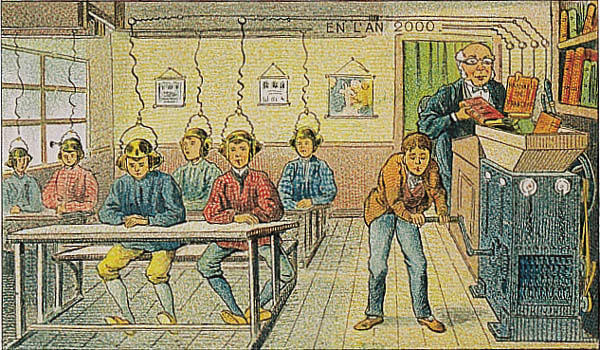 La Belle Époque depiction of a school in the year 2000. Do parents want their children to be taught with computers who feel nothing or by people who care? Is a school an information factory or are they places where we share our cultural values? Can technology ever be bad? What absolutely must be done is technology needs to be evaluated based on its efficacy and not its modernity. That is where the CTP comes in. 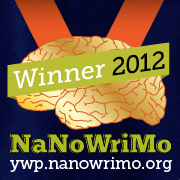 I firmly believe that there is nothing wrong with pen, paper, typewriters, conversations, and the mind. Replacing any of these things with a computer hurts far more than it can ever help.